1) Melt butter in a large saucepan over medium heat then add onions and leeks. Cook, stirring, until onions are limp and just slightly brown. 2) Add sliced potatoes to saucepan then pour in enough chicken broth to just barely cover the potatoes. Continue cooking over medium heat until potatoes are tender. Using a potato masher, mash and stir potatoes until desired consistency is reached. As you mash the potatoes and the soup thickens, turn down heat and stir frequently with a large spoon to prevent scorching on the bottom. 3) Add one cup of heavy cream (or more if you desire) and salt and black pepper to taste. Cook 15 minutes more over low heat, stirring frequently, then remove from heat and serve. 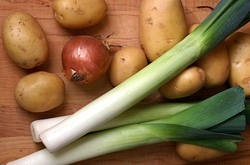 Notes: You don’t need to peel the potatoes as the peels add to the rustic texture of the soup. But make sure to scrub them thoroughly and remove any obvious blemishes before slicing. Although we always make it with chicken broth, this can easily become a vegetarian soup by simply using vegetable broth instead. Cut squash in half and scoop out all the pulp and seeds. Place the halves on a baking dish with the outside of the squash facing up. Place the squash in the oven. Baking time will vary depending on the size and thickness of the squash. They will most likely need at least 45 minutes and may need up to two hours. Test if the squash is ready by poking it in the thickest places with a fork. When the fork slides in easily, it is done. Remove the squash from the oven and let cool until you can comfortably pick it up in your hands. You should be able to easily peel the skin off the squash using a spoon or your hands. Cube the peeled squash and puree using a blender, food processor, or potato masher. Measure out what you need and freeze the rest for later. Pre-measuring for your recipe before freezing makes it easy to use later. Prebake and cool your pie crust of choice. A traditional pie crust is delicious as is a crust made from graham crackers or gingersnaps. Preheat the oven to 350° with the rack in the middle position. Combine the squash, eggs, sugar, and milk. Whisk until smooth. Slowly add the butter, vanilla, spices and salt and mix until smooth and well blended. Pour the filling into the crust. If you have more filling than crust that is ok, just keep it aside. You can often add it after the pie has baked for 5 minutes and settled a bit. Bake the pie until the filling has set, 50-55 minutes. The center should jiggle a little when you gently shake the pie. Put on a cooling rack and let cool to room temperature. Serve topped with whip cream. well. Bake both until softened but still firm, 30 to 35 minutes. coconut oil, cinnamon, and nutmeg in a large bowl. 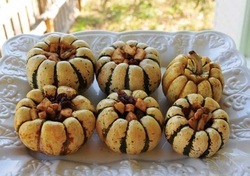 7.Serve squash with their tops as a garnish. Melt the butter in a heavy bottomed skillet over low heat. Add the sugar and heat, stirring constantly, until it has dissolved. Stir in the vinegars, then add the onions and season to taste with the salt and pepper. Increase the heat to medium, cover and cook for 25 minutes, or until the onions are tender and golden. Serve immediately. In a pot, pour some cooking oil, (use whatever you normally use – we use olive oil and it doesn’t affect the taste) and saute the onion until golden brown. Add the ground meat and brown. Add the sake and the water. Bring it to a boil and then add the chicken stock and soy sauce. Add the chopped Chinese cabbage, sesame oil and finally, the white pepper. Simmer until cabbage is done. Once served, you may find it needs a little bit of salt or more soy sauce, (but taste first, because most chicken stock and soy sauce have a pretty high sodium content.) Season to taste and enjoy! to a simmer, cook just until potatoes are tender, 6 to 8 minutes, then drain. When potatoes stop steaming, transfer them to a wide bowl. this dressing over potatoes. Add shallot. Fold together with a rubber spatula. Dressing will pick up creaminess from potatoes. Set aside. in gently. Halve eggs lengthwise, then cut in crosswise slices 1/8-inch thick. Scatter over salad, add remaining dressing, and fold once or twice very gently. 1. Cook orzo according to package directions. 2. 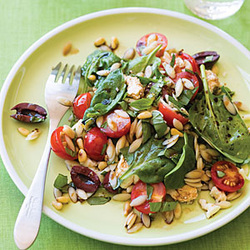 Meanwhile, in a large bowl, combine tomatoes, basil, garlic, pine nuts, olives, feta, and spinach. Add cooked orzo. 3. 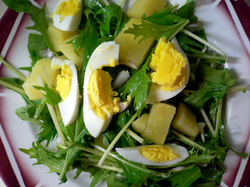 In a small bowl, whisk together oil, vinegar, and salt and pepper to taste; toss with salad. From Food & Wine this recipe is also called Rice and Peas and makes a delicious, spicy side dish. In a large saucepan, heat the oil over	medium heat. Add the onion and ginger and cook over	med. heat, stirring, until softened, about 5 minutes. Add the rice and cook, stirring, until	coated with the oil. Stir in the kidney beans and Scotch	bonnet, then stir in the coconut milk and water. Season with salt and pepper and bring	to a boil. Cover and cook over low heat until the	rice is tender and the liquid is absorbed, 18 minutes. Remove the rice from the heat and let	stand, covered, for 5 minutes. Stir in the scallions and season with	salt and pepper. Discard the Scotch bonnet and serve. Zest lemon to measure 1/2 tsp. Juice lemon to measure 2 tbsp. combine zest, juice, vinegar, sugar,oil and poppy seeds in small bowl; whisk until blended. Place spinach in large serving bowl. 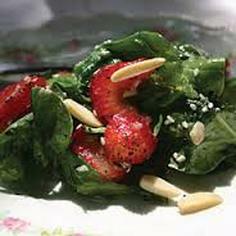 Add onion, strawberries and dressing; toss gently. Sprinkle with almonds and serve. 1. In a mixing bowl, toss squash and	sweet potatoes with melted butter, brown sugar, salt and black	pepper. 2. Spread mixture onto a greased	roasting pan. 3. Bake at 350F for 1-1 1/2 hours, or	until tender. 4. 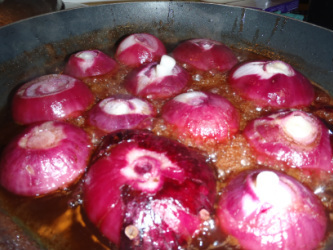 Saute onion in oil in a large pot	until tender, about 5 minutes. 5. Add the scotch bonnet, garlic, and	ginger and cook just until fragrant. 6. Add the thyme, orange peel, curry	powder, nutmeg, cinnamon stick, and bay leaves, mixing everything	thoroughly. 7. When it becomes sticky, add the	roasted vegetables and stir to mix, then the chicken stock, stirring	to keep blending everything. 8. Bring mixture to a boil, then	reduce heat, cover, and simmer for 30 minutes, stirring	occasionally. 9. 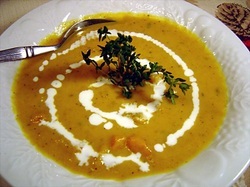 Remove soup from heat and allow to	cool for 15 minutes. 10. Puree approximately 1/3 of the	soup in a blender until it is smooth then add back to soup and stir	well. 11. Add heavy cream and coconut milk	and blend. May also be chilled before serving up	to 1 day. Serve cold or hot, garnished with roasted pumpkin seeds (if	desired). 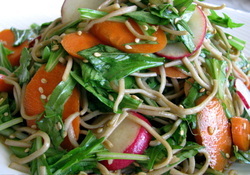 Top with sesame seeds and enjoy!! 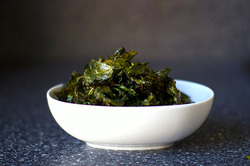 Martha Stewart had several great Kale recipes on her website. Here is one that can be served in many ways. 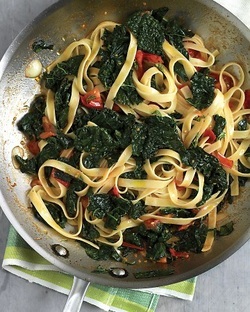 Enjoy this saute as a side, toss with pasta for a main course, or serve on crostini. In a large skillet, heat 1 tablespoon olive oil over medium. Add garlic cloves, thinly sliced, and cook, stirring, until fragrant, 30 seconds. Add cherry tomatoes, quartered, and fresh thyme leaves. Cook until tomatoes begin to break down, 2 minutes. Add kale and cook until heated through, 2 minutes. Season with salt and pepper. Drizzle with 2 teaspoons oil.